At least 120 people were killed in gun and bomb attacks in Paris, on Friday 11/13/2015 at about 21:30 local time, in a terror rampage. Some 80 people of the fatalities are reported to have died at the Bataclan concert hall in central Paris. One of the Paris attackers inside the Bataclan concert hall reportedly shouted “this is for Syria” and “Allahu Akbar”, AFP reported. Gunmen took many hostages there before being overpowered by police. Others died in a reported suicide blast near the Stade de France and gun attacks on city centre restaurants. Seven attackers are reported killed. The deadliest attack appears to have targeted the Bataclan concert hall, with unconfirmed reports saying that some concert-goers were shot after being taken hostage. Police sources told AFP news agency that at least 100 people had died there. Speaking after arriving at the concert hall, President Francois Hollande said the attackers would be fought “without mercy”. At least three gunmen are reported to have been killed at the venue. 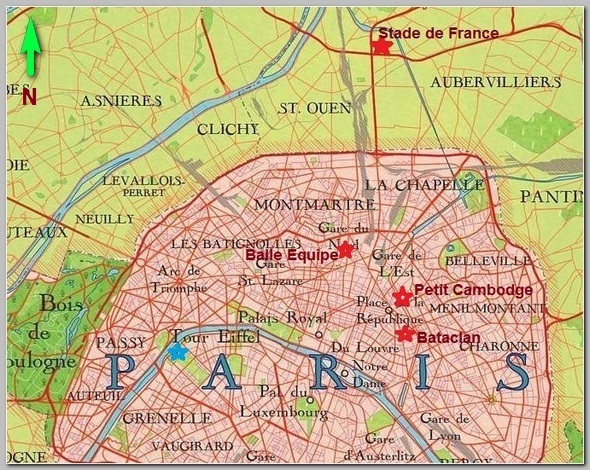 A – Bataclan concert venue, 50 boulevard Voltaire, 11th district – hostages held . B. Le Carillon, 18 rue Alibert, 10th district – gun attack. C. Le Petit Cambodge, 20 rue Alibert, 10th district – gun attack . D. La Belle Equipe, 92 rue de Charonne, 11th district – gun attack . E –Near Stade de France, St Denis, just north of Paris – reported suicide bombing near venue as France v Germany football match played. F – Reports of gunfire at at least two other sites . The near-simultaneous attacks in Paris were an “act of war” organised by Islamic State, France’s President Francois Hollande said, on Saturday 11/14/2015 noon . He said the attacks, carried out by eight gunmen and suicide bombers, were “organised and planned from outside”. B) The current intervention of French Forces in Mali, Syria and elsewhere in the Muslim World. The footage also urged Muslims who are unable to travel to Syria to wage holy war to carry out attacks in France. “Even poison is available, so poison the water and food of at least one of the enemies of Allah” it said. 1) Over 1000 French citizens joined the Jihadi groups in Syria, mainly the Islamic State and Jabhat al-Nusra,. Some of them already returned to France. Many other were arrested or prevented from traveling abroad (see – Western Jihadists ). 2) The Paris multiple attacks are the first example of its kind of the new capacities and abilities of the Jihadi veterans in Europe from Somalia and Afghanistan, from Syria and Iraq and earlier from Chechnya and the Balkans. 3) The recent down of the Russian Metrojet flight KGL9268 over Sinai Peninsula in Egypt, The Jordanian Police Academy shooting, on 11/09/2015 and the Beirut double Suicide bombings, just two days ago, on 11/12/2015, suggest that the Islamic State is heading global, is able to penetrate the most protected locations, to mislead and deceive security and intelligence organisations and to emerge from the Middle East as a global threat even if they are contained in Iraq or Syria. 4) An Islamic terror attack of that magnitude will, most likely, change the approach of all Europe toward Islamic immigration, multiculturalism and Islam.